USB Compact 2-port Hub - Custom Sensors, Inc. 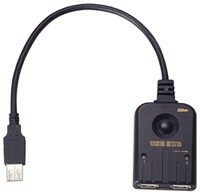 The Model UH-154 is a compact 2-port USB hub designed for use with notebook or desktop computers. It is compatible with both Windows and Macintosh computers and can connect 2 USB 1.1 devices to a single USB port. The unit is powered from the USB port. Note: This is a port-powered hub. It can only be used with low power USB devices that draw 100ma. or less from the port. It cannot be used with higher powered devices, such as printers or scanners. A self-powered hub must be used for these devices.